Just like modern audiences’ strict routine of restraining applause and staying hushed between musical movements, the popular canon of solo repertoire is, in large part, an inheritance of the Romantic era. This means that not only reams of traditional repertoire, but also whole groups of traditional instruments, have fallen into neglect as the casualties of musical “progress.” Thankfully, the campaigns to rehabilitate the harpsichord, lute, cornet, and recorder and their associated repertoire haven’t gone away. In Lucie Horsch we have a leading ambassador for the recorder, which has claim to being the most beguiling classical instrument ever invented. The Decca-signed teenager is the “latest big thing in recorder playing” (The Guardian) who possesses “fearsome virtuosity and superb technique” (BBC Music Magazine). At the MCO, we can’t help but feel sorry for those who missed her performance with us in 2016, a sleeper hit of the season. Nearly everyone is obliged to play the recorder in elementary school. But where most of us squawked and hooted, Horsch fluttered and trilled with the graceful agility of a master quickly in the making. Hear her perform the music of Bach and Vivaldi in true baroque style at our April 2018 concert. You may never see another recorder player, or teenager, as musically gifted as her. Born into a family of professional musicians, seventeen-year-old Lucie Horsch began to study the recorder at the age of five. Things seem to have fallen quickly into place since then: at nine a televised performance of hers caused something of a national sensation, in her early teens she represented The Netherlands at Eurovision, and in 2016 she was awarded the prestigious Concertgebouw Young Talent Award. Evening concert at 7:30 pm; hour-long matinee concert at 1:00 pm; both concerts at Westminster United Church, 745 Westminster at Maryland. Tickets, at $35 for adults, $33 for seniors and $15 for students and those under-30 (incl. GST), will be available 28 July 2017, at McNally Robinson, the West End Cultural Centre (586 Ellice at Sherbrook), Organic Planet (877 Westminster Ave) or MCO’s Ticketline (204-783-7377). “The young musician … once again demonstrates her confidence and genuine fascination for her instrument, from which she creates sounds that one—way too hastily—probably wouldn’t have expected to be possible” (Klassik Akzente). 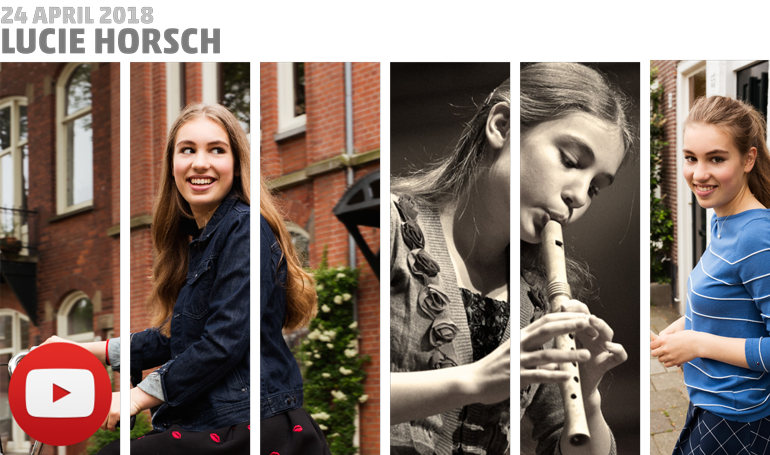 Eighteen-year-old Lucie Horsch is one of the most remarkable musical talents of her generation, and is already in great demand as a solo recorder player both in her native Netherlands and internationally. She was invited to perform with the Los Angeles Chamber Orchestra & at the Norsjø Chamber Music Festival in Norway. Lucie has also performed at the Early Music Festival in Innsbruck, Austria, the Next Generation Festival in Bad Ragaz, Switzerland and the International Chamber Music Festival Utrecht, among others. In 2014, she was chosen to represent The Netherlands in the Eurovision Young Musician contest, and two years later was awarded the renowned Concertgebouw Young Talent Award, in the presence of Sir John Eliot Gardiner. Lucie records exclusively for the Decca Classics label. Her debut disc features concertos and transcriptions of works by Vivaldi, a composer for whom Lucie feels a particular affinity. Being a proud ambassador of the recorder, Lucie is passionate about breaking down preconceptions, to experiment and to push boundaries. Besides performing the broad Baroque repertoire for recorder, both with conductor and also as player/director, she enjoys performing contemporary repertoire. Lucie plays on recorders built by Fred Morgan, Doris Kulossa, Stephan Blezinger and Seiji Hirao, with the generous support of the Prins Bernhard Foundation. She also gratefully uses a specially designed tenor flute from Tokyo. Lucie began to study the recorder at the age of five. In 2011 she was taken on as a student at the prestigious Sweelinck Academie at the Amsterdam Conservatorium, where she is now a regular student with Walter van Hauwe. Also a talented pianist, she first studied with Marjés Benoist and is now in the class of Jan Wijn at the Amsterdam Conservatorium. She was a member of the National Children’s Choir for seven years, performing with conductors such as Sir Simon Rattle, Mariss Jansons and Jaap van Zweden. Several Bach concertos exist in versions featuring different solo instruments. It’s likely that he created the revised versions of many of them to be performed at the Collegium Musicum concerts for which he was responsible, during the term in Leipzig that crowned his career. The piece you will hear at this concert probably originated as a concerto for oboe that he worked on briefly, during the periods he spent in Weimar or Anhalt-Cöthen, before abandoning it. The outer movements were reconstructed from the instrumental sinfonias, known to be part of a lost concerto, that open each part of Cantata No. 35. It’s also possible that the cantata’s first aria was the concerto’s original slow movement. Due to the difficulties posed in reconstructing that aria as an instrumental concerto movement, the second movement is normally performed in modern times in an adaptation from the opening movement of Cantata No. 156, which also serves as the opening movement of the Harpsichord Concerto in F Minor, BWV 1056. The concerto contains a great deal of energy, but by setting it in a minor key, Bach lent it a rather melancholic character. The outer movements call upon the soloist for a great deal of agility and breath control. In between comes a slow movement radiating pure, noble beauty. Lucie Horsch will perform the concerto on soprano recorder. Internationally, this Swedish composer is known by a single work: this charming Serenade. It has been performed at home and abroad more often than any other Swedish composition. Part of that popularity flowed from the final movement, a catchy march, being used as the theme music for Monitor, a long-running BBC television arts program. After studies in his homeland, Wirén relocated to Paris in 1931. Contact with the music of Prokofiev, Honegger and especially Stravinsky led to his adopting Stravinsky’s lean, tart neo-classical style, but infused with touches of romantic warmth. Later in his career, he served in a variety of musical capacities, including pianist, music critic and vice-chairman of the Swedish Composers’ Association. He had a strong theatrical bent, composing ballets and sets of incidental music for plays (including several works of Shakespeare) and music for films. He also created five symphonies, concertos for piano, violin, cello and flute, and numerous pieces of chamber music. In 1960, he composed a television ballet, The Evil Queen, that won a prize, and he created a song, Waltz from Somewhere Else, that was the official Swedish entry in the 1965 Eurovision Song Contest (sadly, it didn’t win). The Serenade for Strings marks Wirén’s clearest homage to Mozart and his serenades and divertimenti. He composed it in 1937, shortly after he returned to Sweden from Paris. He wrote it for conductor Tobias Wilhelmi and the Stockholm Chamber Orchestra. The serenade’s emotional heart lies in the expressive second movement. In it, Wirén offered an occasionally darker emotional tone, and an intriguing contrast between bowed and pizzicato playing. “It’s not going to change your life,” the Fugue for Thought blogger wrote, “but its simple beauty is irrefutable.” Next comes a darting, playful scherzo, once again with passing emotional shadows. An irresistible march, a witty parody of anything you care to name—a brass band or goose-stepping soldiers have been put forward—closes the score in toe-tapping fashion. Don’t be surprised if you find yourself whistling the main theme as you leave the church! In the final decades of the seventeenth century, the modern, transverse flute (so called because the performer holds it sideways to the face) first began to dominate its predecessor, the recorder (which is held straight ahead), then virtually replaced it. Italian composers felt some reluctance in writing concertos for flute, until a visit from the German virtuoso Johann Joachim Quantz in 1726 changed their minds. The next year, Vivaldi first made prominent use of the flute in his opera Orlando furioso, where it decorated an aria in spectacular fashion. The six flute concertos that make up his Op. 10 were published in 1728 by Michel-Charles Le Cène of Amsterdam. The title page indicated that they had been printed at the publisher’s own expense, suggesting his belief that the market was ready for music showcasing the instrument. Hefty sales proved his instinct correct. The concerto you will hear at this concert is the opening work in the Op. 10 collection. It bears the evocative subtitle The Storm at Sea. The same nickname is connected with other works of Vivaldi: multiple concertos for flute, oboe, violin and bassoon, both in F Major and bearing the Ryom catalogue numbers RV 98 and RV 570; and the Violin Concerto in E-flat Major, RV 253. The reasons behind this multiplicity, and the origin of the subtitle, remain unknown. Regarding the compact concerto you will hear on this program, the bold, bustling character of the outer movements certainly qualifies it for the subtitle. Lucie Horsch will perform the concerto on alto recorder. During Sammartini’s lifetime, his fame was overshadowed somewhat by that of his younger brother, Giovanni Battista, who made important contributions to the development of the Classical symphony. Giuseppe wrote music too, both instrumental and vocal, but was best known as a performer. In fact, an English obituary said of him, that he was “thought to be the finest player on the oboe in Europe.” He had risen to the position of soloist in the opera orchestra of his native city, Milan, before moving to England in 1727. His gifts made it easy for him to find work. He played in the orchestra that Handel regularly assembled in London, at the King’s Theatre, to perform his operas. Later, he came into the exclusive, private employ of the Prince of Wales. During this period, most recorder music written on the continent featured the treble member of the family. English composers and performers, on the other hand, preferred the smaller descant and soprano instruments. This Concerto in F Major can therefore be safely assigned to Sammartini’s period in England. Still, it follows the three- movement, fast–slow–fast structure standardized in Italy. The outer movements are sunny and vivacious, giving the soloist little time to draw breath. In between comes a gently melancholic and melodically appealing siciliano. Lucie Horsch will perform the concerto on soprano recorder. This charming work probably dates from shortly after Mozart’s most prolific symphony-writing period, 1770 to 1773, during which time he composed no fewer than 28 symphonies. Research has shown that the catalogue numbers assigned to several of these works do not accurately reflect the order of composition. Mozart wrote the well-known Symphony No. 25 in G Minor in October 1773. Its highly dramatic nature reflected the exposure to the music of Joseph Haydn and other progressive composers that he had undergone in a recent trip to Vienna. Next in order, in April 1774, came the sunny work known as No. 29. The precise date of No. 28 is still being debated, in part because some unknown person made a strong effort to erase it from the manuscript score. The most likely time is November 1774, which places it after Nos. 29 and 30 (composed in April and May 1774, respectively), and four years before the next symphony, No. 31, the ‘Paris’ Symphony. Mozart constructed the brisk opening movement on a spirited first theme and a gracious second. Author William Malloch writes that “the music is not grand, but smart ‘society’ music full of the frivolous laughter of the sort quietly captured by Elgar in the Enigma Variations’ tenth variation, Dorabella.” In the second movement, Mozart calls for the strings to play with mutes, enhancing this sweet, flowing music’s genteel quality. The following minuet continues the second movement’s moderate pacing and dignified manners. The finale abandons all caution as it races merrily to a near-breathless conclusion.